For its eighth Hopfest, the Alehouse Project team ensured there would be the usual lineup of rare, new or one-off beers on offer. And among them is the first collaboration brew featuring the venue's owner, Alex Summers. The man who has become something of a hero to the beer nerds of Melbourne's north for his nonstop efforts to secure beers they've not seen before and probably won't again hooked up with one of his favourite breweries, Mornington Peninsula, and together they crafted the sort of beer his regulars would like to use to give their back palates a good working over. 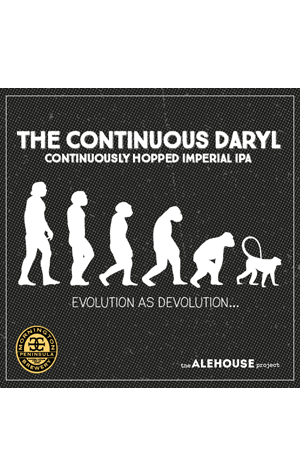 The Continuous Daryl (Daryl being a reference to Daryl Somers / Summers) is a continuously hopped double IPA, a method so named for its constant and regular hop additions and which was made famous by Delaware brewer Dogfish Head and its 90 Minute IPA. The first kegs are being tapped at Hopfest 8 on April 17, with kegs hitting other venues (including one in Queensland and one in NSW) soon after. According to head brewer AG: "Daryl and the sweaty mammal (Mornington's sales guy Michael) conceived the rudimentary bones of an idea for a beer: they wanted to brew a Double IPA that was lighter in colour than most. I did say rudimentary. They then, with their extensive knowledge of malt and hops, came up with a list of ingredients from which l devised said recipe. At some point after this the sweaty mammal and I decided that continuous hopping might be worth a try. "Suffice to say that input from Daryl up to this point was minimal but his time in the sun would come. Come brew day the excitement was palpable. Once the wort was in the kettle and boil reached, Daryl truly came into his own. Standing on the brew deck for a full 50 minutes Daryl drip fed Amarillo hops into the kettle in a continuous manner – disciplined and unwavering. Then, normal transmission recommenced. Daryl and sweaty mammal took off before the brewday was complete leaving me to wash down and pack away." As for the beer, it's a double IPA at 8.5 percent and 90 IBUs featuring Pilsner, Golden Promise and Carapils malts with Sorachi Ace and Mosaic supporting Amarillo as the starring hop.